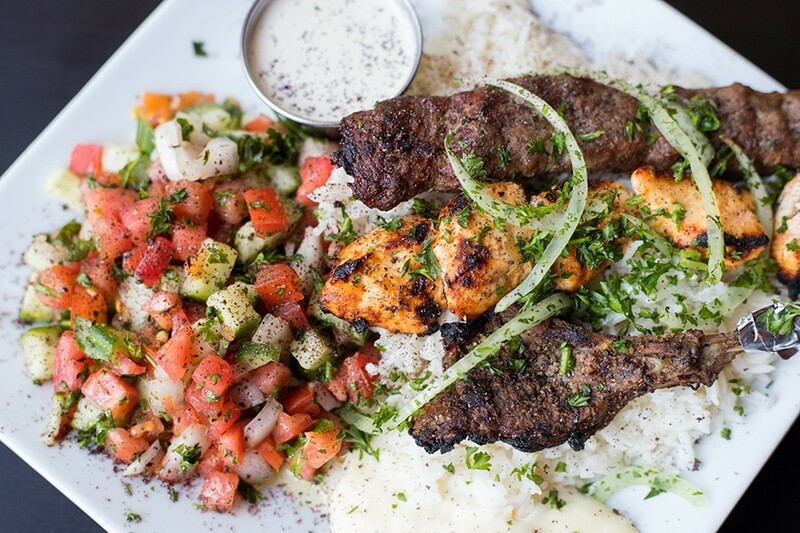 Levant mixed grill features shish tawuk, beef kebab and lamb chop. Ahmad Hameed has been cooking professionally since he was fourteen. He's worked in the kitchens of some of the Middle East's most luxurious properties, including the awe-inspiring, seven-star Emirates Palace in Abu Dhabi. And yet when his mom comes into the kitchen to check his cooking, he still holds his breath. You'd think Hameed would be confident in his abilities at this point in his career, and indeed he is — and has been ever since he entered Damascus' premier school for hospitality studies as a teen. At first, he thought of cooking as a purely practical career path, but when he got into a professional kitchen, something clicked. Mixing professional techniques with what he'd learned by watching his mom in their home kitchen, he began to cultivate a skill set that would take him around the world. From Abu Dhabi to Dubai, Damascus to Thailand, Hameed worked the line at one luxury hotel after another. Though he was happy with the direction his career was taking, he felt the pull of family and decided to join his brother, Aboud Alhamid, in St. Louis. 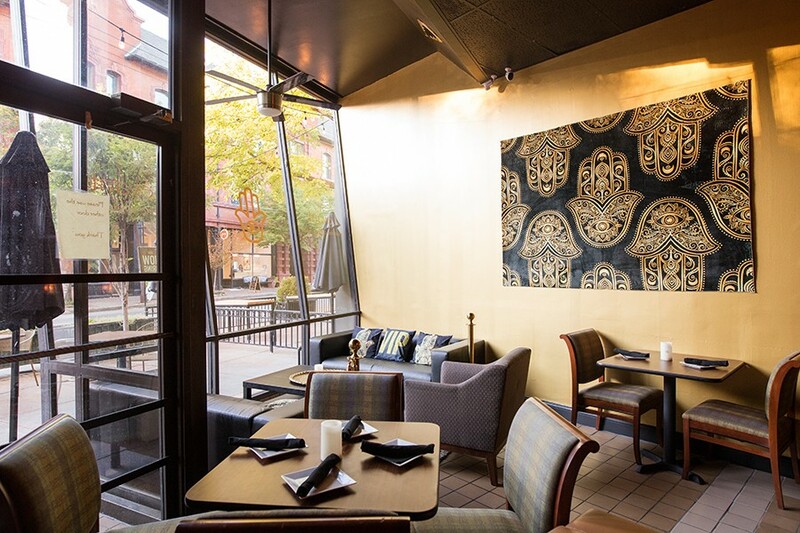 Hameed arrived in St. Louis in February 2015 and immediately began cooking at his brother's restaurant, Ranoush, a Loop favorite for its repertoire of Middle Eastern specialties. Hameed was proud of the food he was putting out, but he couldn't help but feel that authentic home-cooked Levantine cuisine — the food his mom cooked for him and his brother back in Damascus — was missing from the city's dining scene. He searched high and low at local Middle Eastern restaurants, and when he couldn't find what he was looking for, he decided to take matters into his own hands. 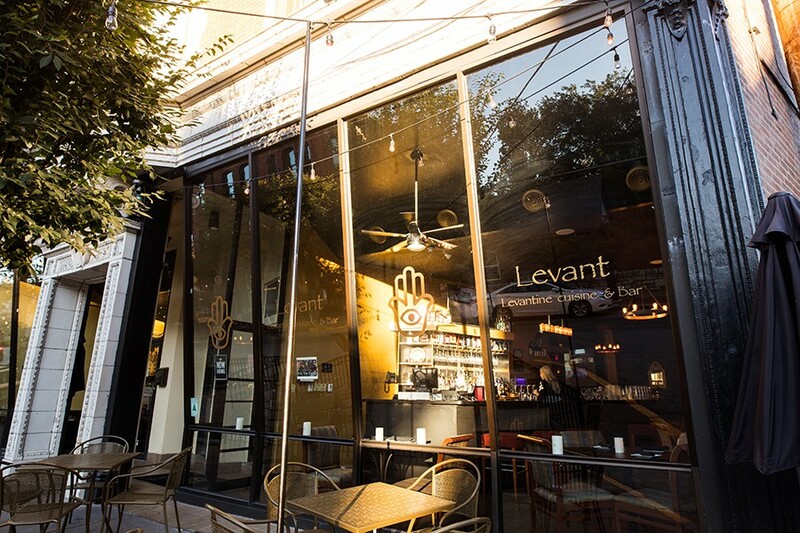 In June, Hameed realized his vision with his debut restaurant, Levant. 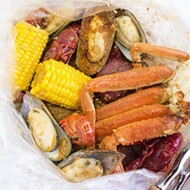 Though not necessarily an homage to his mother, the place evokes the experience you'd have feasting on traditional comfort-food dishes around his family's dining-room table. Her presence is always felt, sometimes literally: Whenever she is in town, Mama Hameed makes a point to check on what her son is up to in the kitchen, tasting his dishes to ensure that the thread of authenticity runs unfrayed from the Central West End to the kitchen in Damascus that inspired them. The former Kopperman's space is unrecognizable today. Hameed's embrace of Syrian comfort food does not mean a homey environment. 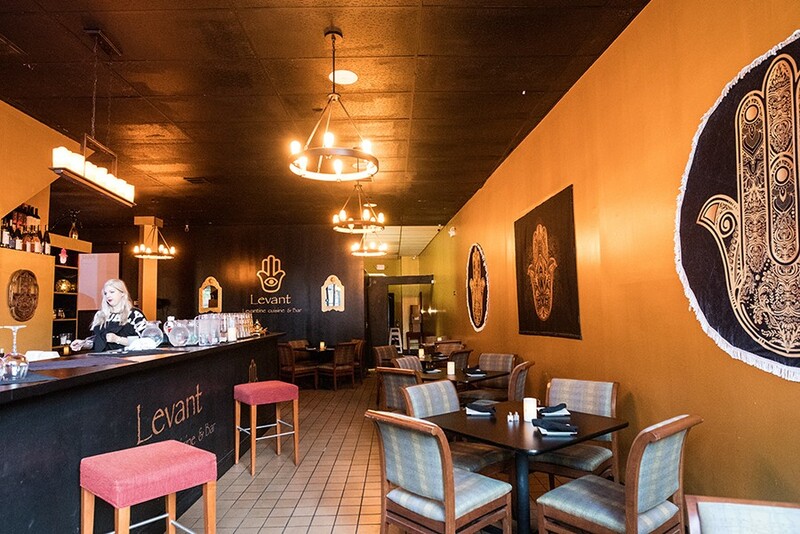 Located in the old Kopperman's space on Euclid Avenue, Levant has transformed a Jewish delicatessen into a sultry lounge-like restaurant painted wall-to-ceiling in black. Along with its lovely street-facing patio, the space is divided into two rooms: One consists of the bar, the other is a dining room. To the back of both is a roped-off "VIP Lounge" with couches and low tables. 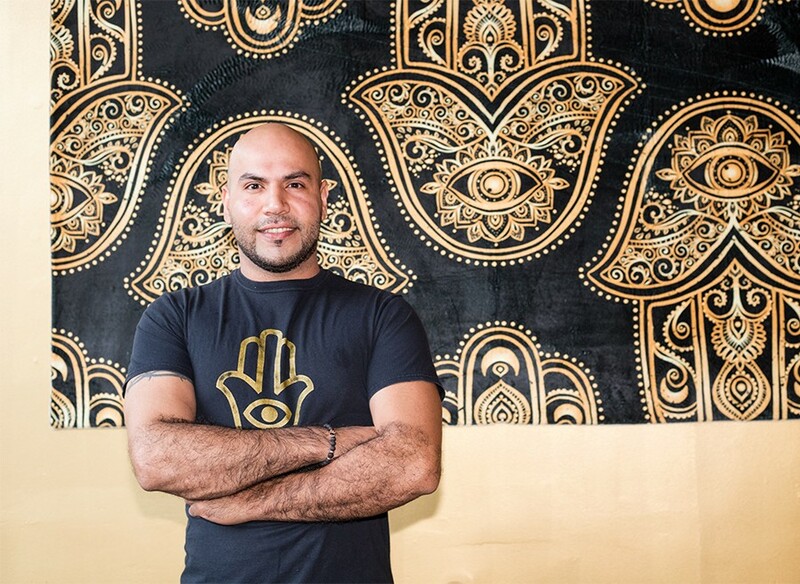 Gold décor provides an accent, mostly in the form of paintings of the hamsa; the image of an eye inside of a palm is found all around the restaurant, including its logo. Lore holds that the hamsa is meant to ward off the evil eye that brings back luck. Hameed needs no such protection, as his cooking alone is good fortune incarnate. His deft hand takes a dish as ubiquitous as hummus and turns it into a masterpiece — heavily flavored with tahini, then brightened with fresh-squeezed lemon and olive oil. The deeply nutty chickpea concoction is so smooth it's the texture of velvet. It's flawless. If the hummus is rich, the lebneh is positively decadent. The thick yogurt, a staple of Lebanese cuisine, is as silken and rich as Ted Drewes custard; slathering it over a slice of pita bread is as indulgent as spreading triple cream cheese over baguette. Equally satisfying is the housemade halloumi cheese, its mild, briny taste reminiscent of an Italian stracchino. Flecked with dried mint and served warm with a side of pita, it's a deconstructed Syrian cheesy bread. 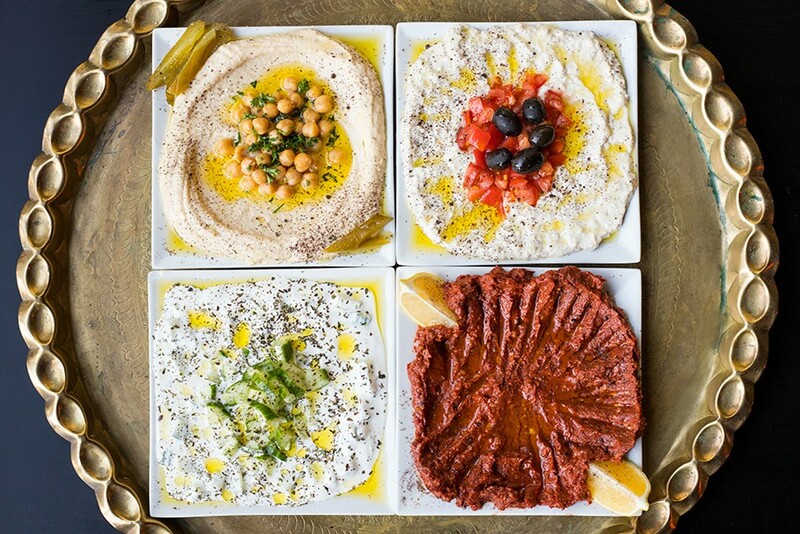 A selection of Levant's cold appetizers and salads: hummus, baba ganoush, yogurt cucumber salad and mouhamara. You might mistake the vibrant red kibbeh naeh for tomato paste, but its flavor is infinitely more complex. Made from crushed bulgur wheat, red peppers, tomatoes and pomegranate, the dip has the tang and texture of a sun-dried-tomato puree, with a suggestion of heat that lingers at the back of the throat like a mild Indian masala. The flavor is electrifying. Sapanikh arrives at the table looking like a bowl of simple steamed spinach; it proves anything but. The delicate leaves are enlivened with pomegranate molasses and lemon juice, making them pleasantly mouth-puckering. And if the flavor is thrilling, the texture is positively stunning: Somehow, Hameed manages to soften the leaves without breaking them down, leaving them downright creamy. I can't think of a better use of spinach. 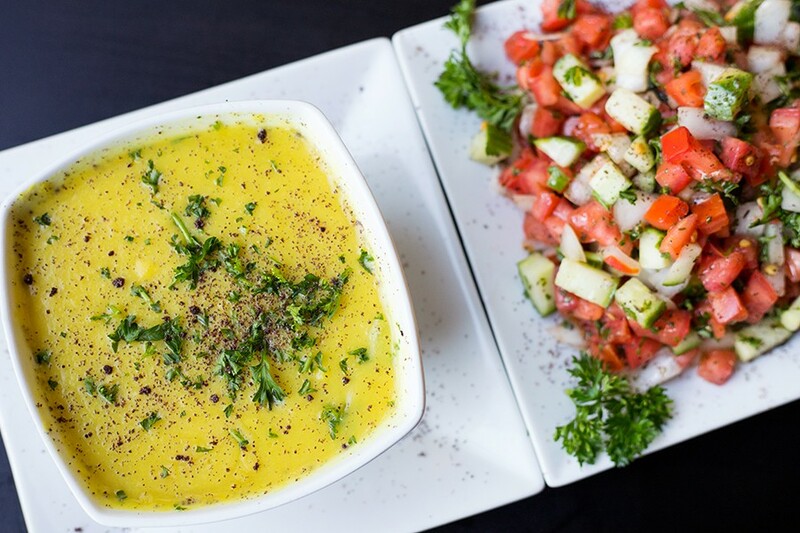 Levant's falafel is different than other versions in town. Instead of a coarse, rustic fritter, this version is dense and finely ground, creating a texture reminiscent of a doughnut (perhaps the cinnamon undertones also lead to that association). Personally, I prefer fluffier, more savory takes on the Middle Eastern staple, but this was a welcome change from the norm. Lentil soup and "Aboud's salad": tomato, cucumber, onions, dry mint, olive oil and fresh lemon. Is it laughable that Levant's best dish may be its chicken wings, a dish you're more likely to find at a sports bar than a Syrian home kitchen? Perhaps, but Hameed does not let that stop him from making what may be St. Louis' best interpretation of wings and drummies. The key to their success is how succulent the meat is. Even the outer edges of the drummy fall apart in your hands like chicken confit. The meat is so sumptuous, it's as if it's been poached in olive oil. 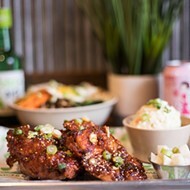 Gently seasoned with garlic and herbs, the wings are accompanied by a side of a creamy garlic puree that will make you question why anyone wastes their time with ranch dressing — or, for that matter, any other chicken wing in town. The kitchen's prowess with poultry is also evident on the shish tawuk, a master class in how to properly cook white-meat chicken. The meat is so tender and juicy you'd think it was injected with olive oil and lemon, but Hameed explains it's the result of a marinade technique he's perfected over the years. Simply served over a bed of rice with garlic puree for dipping, this is pure comfort. 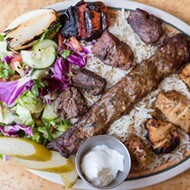 Even in the mixed grill, where it's served with a tender beef kabob and well-seasoned, perfectly charred lamb chop, it's a scene-stealer. 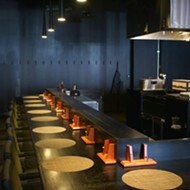 The restaurant includes a lounge and a spacious patio with sidewalk seating. Though Hameed excels in his grilled items, he is particularly proud of the more traditional Levantine main courses that remind him of home. These include the kibbeh labaneh, in which tender fritters of beef, bulgur wheat and spices bob in a warm yogurt sauce. The savory kibbeh soaks up the yogurt, softening so it breaks apart when prodded and stews in the rich liquid. Molokhiya is another uniquely traditional item. Made from the leaves of the corchorus olitorius plant, also known as "Jew's mallow," it looks like a simple stew of greens but has a complex flavor that evokes fenugreek, cardamom and sweet black licorice. Studded with whole cloves of roasted garlic and meant to be ladled over rice, it's like a Middle Eastern version of saag. It's enjoyable, but an acquired taste. More approachable is the kossa be al laban, a stew-like concoction of sliced zucchini that has been simmered in a delicate yogurt garlic sauce. The savory zucchini infuses the yogurt, softening its tartness and transforming it into a light cream sauce with nutty undertones. 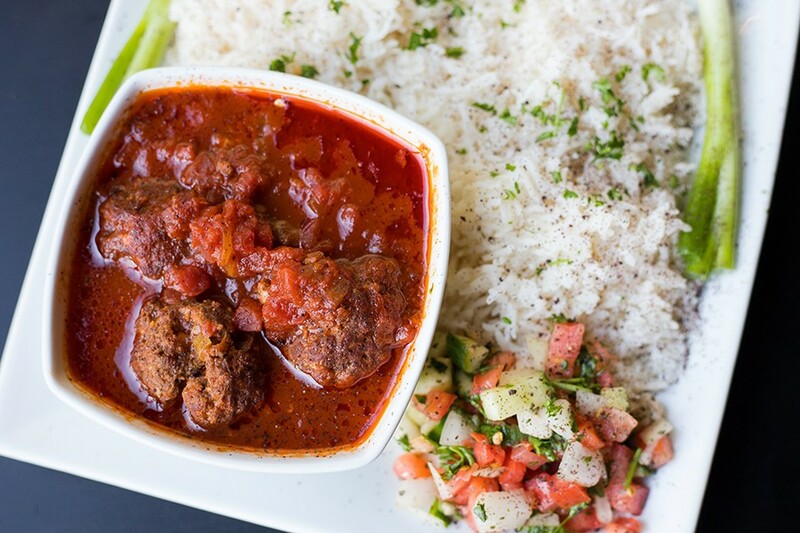 Dawood basha, or meatballs cooked in tomato sauce with onions and garlic, are served with rice and salad. Our server highly recommended the sharhat motafayeh, a dish of thinly pounded beef (you can also opt for chicken) drenched in olive oil, lemon and garlic, and it did not disappoint. It sounds so simple — and it is — but what more do you want than the simple pleasure of savory beef enlivened with oil, garlic and citrus? It's satisfying as is, but the razor-sharp, briny olive salad that dresses the meat adds an extra layer of brightness that cuts through the beef's richness. The highlight of the dish, however, is the potatoes that accompany the meat. Fried like golden potato croquettes, they are clearly the handiwork of someone who knows how to cook. If one dish exemplifies what Hameed is trying to do at Levant, it's the dawood basha, or Syrian meatballs. Fork-tender spheres of ground beef are simmered in a tomato sauce that has the subtle warmth of cinnamon and baking spices. 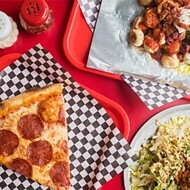 As the meatballs slow-cook in the sauce, their beefy flavor enriches the sweet tomato concoction, each component picking up the best parts of the other. You can just picture yourself sitting around the kitchen table in Damascus as Mama ladles serving after serving onto your plate. It's a heavenly vision. You can also picture Hameed's mother standing in Levant's kitchen, glancing back at her son as she watches a pot of dawood basha bubble on the stove. It's a nerve-racking experience, for sure, but Hameed can comfortably exhale. Not only is he doing his mom's cooking justice, but he's also surely making her proud.